← WHO WILL REPRESENT THE FORTY-EIGHT PERCENT? So, today, Jeremy Corbyn launched his leadership campaign. It was the opportunity for him to make the case that he was the genuine radical that his supporters have been claiming. To put his case that “Corbynism” was the revolutionary (perhaps that’s too charged a word) change that some see as inevitable if he is re-elected. The speech, though, was a damp squib. There was almost no content and what there was as neither new nor particularly radical. There were two substantive policies discussed. The first one was a National Investment Bank, which Corbyn claimed was John McDonnell’s idea (he made an announcement on Monday) and presented as a radical breakthrough, but is actually a Keynesian standby (supported by liberals like Robert Skidelsky) and it has been proposed by Labour since at least 2011 under Miliband and Balls. A national investment bank is a good idea, but it is not a particularly new or radical one. This leadership started with lots of interesting (if sometimes flawed) economic proposals for things like Richard Murphy’s “People’s Quantitative Easing” (PQE) and the promise of a broad-based progressive economic strategy lead by an advisory team featuring big names like Piketty, Pettifor and Blanchflower. That promise has evaporated. PQE is no more and the economic experts have departed in bewilderment and discontent. The other policy announcement was the extension of pay audits to smaller companies and to a broader range of inequalities. Pay audits were introduced in the 2010 Equality Act – the last piece of legislation proposed by Gordon Brown’s administration. They came into force in 2014 although the coalition somewhat watered down the original proposal. Pay audits were a policy promoted by all parts of the Labour Party, including genuine Blairites like David Miliband when he stood for Labour leader in 2010. Again, this is a good policy. And the proposed extension is a good idea too, but it is not a radical break with the past. It is not a policy that reflects the claims that Corbyn is somehow offering alternatives that are outside the Labour mainstream. If this is Corbynism, then Corbynism is only marginally more radical than the “Red Tory” policies of the Blairites his supporters so vocally hate. We have, therefore, a dramatic distinction between the rhetoric of Corbyn and his followers (that promises some sort of “real socialism” of a kind the PLP are unable to deliver) and the reality of the policy proposals (which are warmed-over existing policies that have been promoted by all sides of the party for years). We have vitriolic attacks on mainstream Labour politicians who, if they express frustration with Corbyn’s inept approach to managing the party, are accused of being traitors and threatened with deselection. We have claims by Corbyn that his leadership has delivered a string of victories while the Labour whips in the House of Lords point out that he has never even spoken to them about the policies on which they delivered crucial defeats to Conservative proposals. Corbyn is breaking the Labour Party – his leadership has been a string of missed opportunities and self-inflicted wounds, we have had disastrous local elections (despite the leadership’s spin), a disastrous EU referendum campaign, and our poll rating (at a time when, traditionally, oppositions should be making hay) is shocking. The latest polling puts the Labour Party on 29% – at the same point after the 2010 election Labour was scoring 44% ­­and that still wasn’t enough to win. One poll showed that, even if only people who voted Labour at the 2015 General Election voted in the next one, Labour could still get beaten. Corbyn is, on the basis of all the evidence available, leading Labour to annihilation. The Parliamentary Labour Party has been portrayed as a bunch of plotting Blairites who, en masse, have been working against Corbyn since the very beginning. But Corbyn and his team did not always believe this. When they drew up their initial analysis of the Labour Party (which they then sloppily leaked) they placed 74 MPS in their “core group” or “core group plus” – those who were instinctively supportive. Only 36 MPs were judged to be openly hostile and 50 were said to be negative. The rest of the Parliamentary party – the largest group of 77 MPs – were judged neutral. So, just nine months ago, the analysis of Corbyn’s own team was that the Parliamentary Party was, more-or-less, evenly balanced. 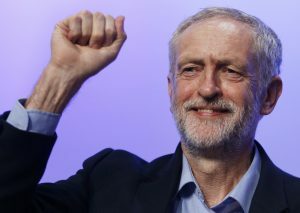 A mixture of silly appointments – the reliance on key figures who had a long history of insulting Labour MPs (Fletcher, Milne, Lansman, Livingstone) – incompetence against a weak government and the apparent inability (or unwillingness) of Corbyn to engage with those outside his tiny core group has thrown away the chance to build alliances. Now Corbyn can’t find enough support in the PLP to fill cabinet. This isn’t a sign that, as some of Corbyn’s swivel-eyed supporters contend, the PLP is riddled with secret Tories – it is evidence of the fact that he is incapable of leading a party in which he has always been on the fringe. The Labour Party is being torn apart. Members are insulting members. Long serving representatives – people who have spent decades at the very core of Labour – are being accused of being Tories, threatened with deselection and facing attempts to drive them for the party. The Labour Party’s very existence is in doubt. Corbyn himself is, apparently, happy to see the party split if it increases his control. And, again, the question is: What is all this chaos for? 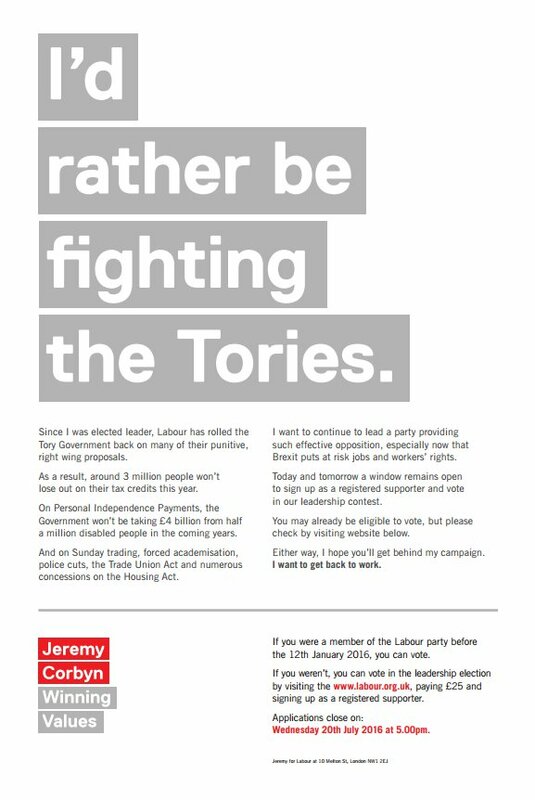 So that Corbyn can offer barely modified, uninspiring, updates of policies the party has held for years? The irony is that Corbyn’s supporters claim that he is an “authentic” character – a politician that puts substance before style. But the truth is exactly the reverse. Corbyn’s style, the hair-shirted prophet of an era of true socialism, promises far more than the substance of any policy announcements he has made. The image is radical but what has been offered is banal. Corbyn’s supporters accuse all those who oppose them of being reactionary but, in the few days since he announced his candidacy, Owen Smith has proposed more radical and more interesting policies than Corbyn managed in nearly a year. Smith’s proposals to ensure that all future Labour policy is judged on the basis of its contribution towards cutting inequality, to invest in a major “new deal”, to reinstate the Department of the Environment and tackle climate change, to make ethical foreign policy backed up by parliamentary scrutiny with the power to block government plans for war, to create a “members’ shadow cabinet” and to fight to protect our status in the EU are clear, radical and realistic. The response of Corbyn’s team has been to smear him because of previous jobs and lie about his record in parliament. I understand the emotional appeal of Corbyn – he makes his supporters feel good about themselves. He makes them feel virtuous. But the reality of his leadership – the inept management of people, the lack of ability to challenge Conservative leaders in the Commons, the shocking poll performance and the failure of imagination in his policy proposals – leaves me increasingly confused as to what Jeremy Corbyn is for. The more we see, the less point there seems to be. This entry was posted in Politics and tagged 2016, Corbyn, Labour, Labour Party, Leadership, Owen Smith, Politics. Bookmark the permalink.